A little self-plug. I have an article on an introduction to panoramic photographic technique the November issue of Photo Technique with a few panos in it. This is old world journalism, folks -- you have to read it on paper at least for now. I shoot lots of large panoramas, and the arrival of various cheaper robotic mounts to shoot them, such as the Gigapan Epic Pro and the Merlin/Skywatcher (which I have) has resulted in a bit of a "mine's bigger than yours" contest to take the biggest photo. Some would argue that the stitched version of the Sloane Digital Sky survey, which has been rated at a trillion pixels, is the winner, but most of the competition has been on the ground. For many years I have had a popular article on what lenses to buy for a Canon DSLR. I shoot with Canon, but much of the advice is universal, so I am translating the article into Nikon. If you shoot Nikon and are familiar with a variety of lenses for them, I would appreciate your comments. At the start of the article I indicate the main questions I would like people's opinions on, such as moderately priced wide angle lenses, as well as regular zooms. 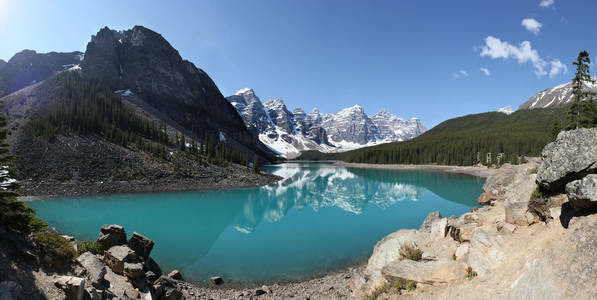 Moraine Lake, in Banff National Park, is one of the world's most beautiful mountain scenes. I've returned to Banff, Moraine Lake and Lake Louise many times, and in June, I took my new robotic panorama mount to take some very high resolution photos of it and other scenes. Best collaborative processing and tagging of a group's photo archive? I have the photo archives of a theatre company I was involved with for 12 years. It is coming upon its 50th anniversary. I have a high speed automatic scanner, so I am going to generate scans of many of the photos -- that part is not too hard. Even easier for modern groups in the digital age, where the photos are already digital and date-tagged. Read more about Best collaborative processing and tagging of a group's photo archive? I'm waiting for the right price point on a good >24" monitor with a narrow bezel to drop low enough that I can buy 4 or 5 of them to make a panoramic display wall without the gaps being too large. Today, fewer and fewer photos are printed. We usually see them on screen. And more and more commonly, we see them on a widescreen monitor. 16:9 screens are quite common as are 16:10. You can hardly find a 4:3 screen any more, though that is the aspect ratio of most P&S cameras. Most SLRs are 3:2, which still doesn't fit on the widescreen monitor. Back in March, I took my first trip to the middle east, to attend Yossi Vardi's "Kinnernet" unconference on the shores of lake Kinneret, also known as the Sea of Galilee. This is an invite-only conference and a great time, but being only 2 days long, it's hard to justify 2 days of flying just to go to it. So I also conducted a tour of sites in Israel and a bit of Jordan. I'm really enjoying my Canon EOS 5D Mark II, especially its ability to shoot at 3200 ISO without much noise, allowing it to be used indoors, handheld without flash. But as fine as this (and other high end) cameras are, I still see a raft of features missing that I hope will appear in future cameras.